If you’re looking for Montana colleges, there are several sites worth visiting. The MontanaColleges.com website is sponsored by the Montana Post Secondary Educational Opportunities Council (MPSEOC). Users can create an account and have their information sent to Montana colleges. They can also generate a bar code to use at college fairs sponsored by MPSEOC. The most useful item on the website is the Interactive Guidebook. It basically contains all the items you would expect on a comprehensive state college search website including a personality type test, timelines, checklists, considerations for selecting a college, information on college athletics, a comparison worksheet, and a financial aid overview. The website does contain profiles of participating colleges which includes scholarship information. The SmartAboutCollege.org website is sponsored by the Montana Higher education Student Assistance Corporation (MHESAC). The website has sections targeted for each year in high school with check lists for both students and parents. Users can download spreadsheets to calculate college costs and compare financial aid packages. The site also has information on College Goal Sunday as well as links to useful college related websites. Users can find information on Montana specific financial aid on the SmartAboutCollege website and the Montana Higher Education Student Assistance Corporation. Montana residents can use the Montana Career Information System to create portfolios, search for financial aid, and practice the SAT and ACT. Students interested in starting at a community college and transferring to a public university in Montana should visit the Montana University System. 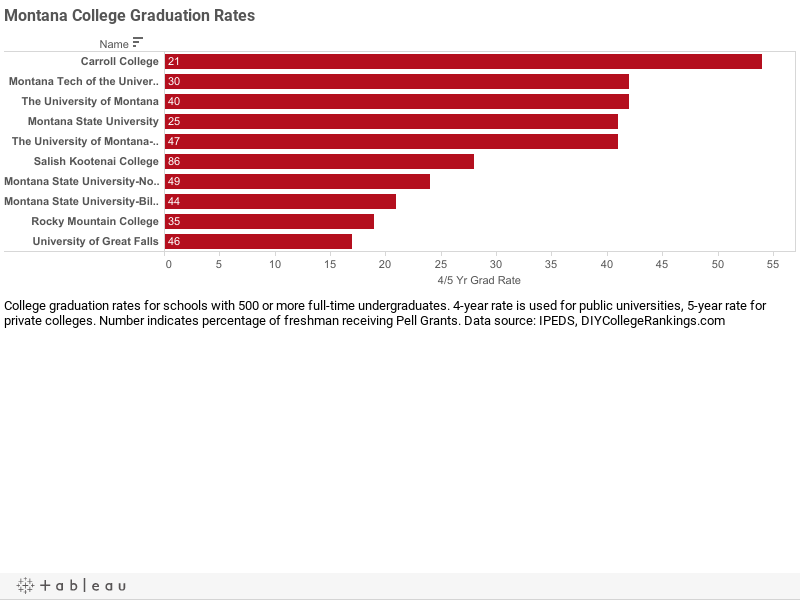 There are 10 four-year Montana colleges with 500 or more full-time undergraduates according to the Integrated Post-secondary Education Data System. Approximately 12 percent of students attend one of the four private Montana colleges while 88 percent of students attend one of the six state institutions. The private Montana colleges have an average four-year graduation rate of 29.5% and the public universities have an average five-year graduation rate of 35.2%. One school meets the DIY College Rankings 50-50 profile requirements. College-bound seniors in Montana had an average of 20.5 ACT Composite score with a 19.3 for English and 20.5 for Math. The 75th Percentile scores were a Composite of 25, 23 for English, and 24 for Math. Of the schools reported scores, a total of five colleges ACT 75th% Composite scores were at or above this level.